Hi! I'm interested in the 2009 CHEVROLET MALIBU LTZ 4dr Sedan w/HFV6 Engine Package you have listed on AutoAndTruckConnection.net for $8,999 (Stock #: 155025-SOM81). Please contact me as soon as possible. Thanks! By clicking "Check Availability", you accept our Terms Of Service & Privacy Statement and agree to allow the seller to contact you. Fuel estimates based on $2.83 per gallon and 15k miles per year. Actual costs may vary. Hi! 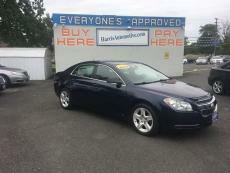 I'm interested in the 2009 CHEVROLET MALIBU LTZ 4dr Sedan w/HFV6 Engine Package you have listed on AutoAndTruckConnection.com for $8,999 (Stock #: 155025-SOM81). Please contact me as soon as possible. Thanks! All information is deemed reliable but not guaranteed. Please contact the seller via email or call them at 908-755-1400 to confirm all information including vehicle availability prior to your visit. Neither AutoAndTruckConnection.net® nor our advertisers are responsible for typographical errors, mistakes, or misprints, including but not limited to, pricing errors, individual vehicle disclaimers, finance options, or an incorrect statement of features and/or accessories of a particular vehicle. Click here for more details.